Overhead Paging: This is an additional service that can be purchased separately. For more information, refer to Set up Overhead Paging. 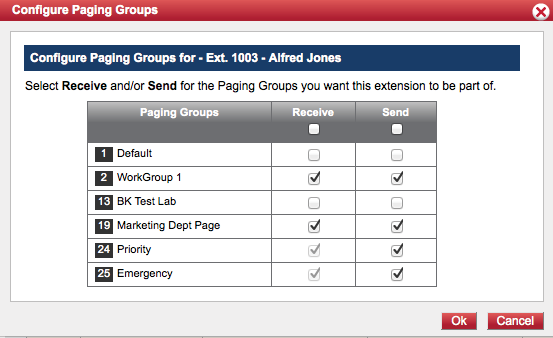 Create and manage your paging groups using 8x8 Account Manager. 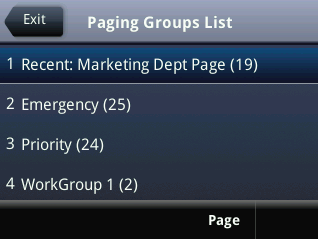 Create up to 25 paging groups; the same extension can be included in multiple groups. Define who can broadcast pages and who can only listen. Set priority levels for your pages: Normal, Priority, and Emergency. -Polycom firmware version 4.0 or higher is required. -Group paging uses IP multicast to send group pages to registered phones. This technology requires that all phones in a group page must have access to the same multicast IP address. In most cases, this requires that all phones receive their IP address from the same router. Geographically-dispersed phones that are serviced by separate routers will not support uniform access to intercom group paging. 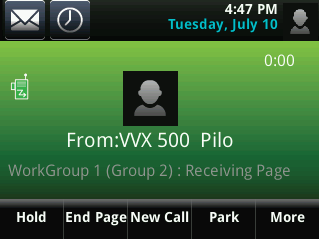 Before using group paging, each telephone participant must be configured. On Group Paging, click Configure. To create a name or label for the group, click the Edit Group Label link. Then enter a new group name. In our case, we have created a group called WorkGroup 1. 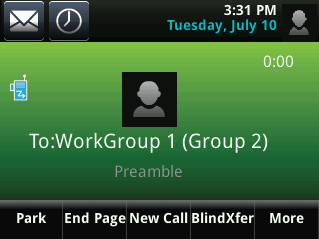 Select the new group (in this case, WorkGroup 1) from Paging Groups. Make sure it becomes highlighted. Next, select the extension that participates in the group by searching and selecting the extension numbers. In this example, four extensions have been included in the group. As highlighted, the user has selected extension 1003 for the detailed configuration. On extension 1003, the user has selected the ability to send and receive two normal groups and the ability to send in Priority and Emergency groups. Note: You cannot unsubscribe from a Priority or Emergency group. A Priority page interrupts Normal pages or active calls. An Emergency page will interrupt Normal pages, Priority pages, and active calls and plays out at near maximum volume even if Do Not Disturb (DND) is enabled. 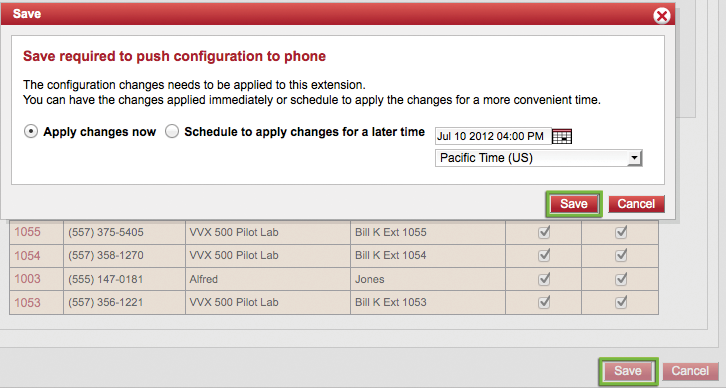 In this example, the user has configured extensions 1003, 1055, 1054, and 1053, and can now save the configuration. Users are given the option to save now or save at a time when it is more convenient to restart the phone. 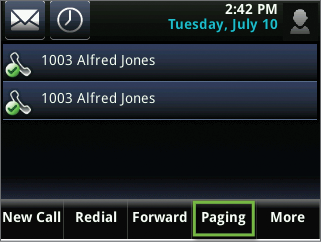 When a user returns to their Polycom VVX500 desktop phone, they can see Paging among the screen menus as well as the paging group list. The new group (in this case, WorkGroup 1) is active, as shown below. Making a page from a Polycom VVX500 shows a preamble screen. During the preamble, the phone has located all the phones in the page and is sending a short tone to all the phones in the group page. The phone quickly transitions to paging mode. At this point, a user can speak into the handset or speakerphone and a one-way page is transmitted to all participants. Receiving a page shows the name of the group page and the status.